Chicago for 41 years and was chief executive officer for 22 years, building a successful business and a corporate culture that encouraged self-improvement, civic participation, and philanthropy. He has championed the value of a liberal arts education and the humanistic tradition. In 1988, Franke helped found the Chicago Humanities Festival, which continues to bring together artists and culture critics from all over the world. In 1997, he was in the first cohort to receive the new National Humanities Medal from President Clinton for “bringing the pleasure of art and ideas to the people of the great city of Chicago.” In 2000, he received the Phi Beta Kappa Society’s National Award for Distinguished Service to the Humanities. 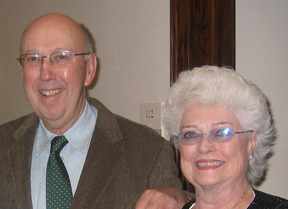 Franke’s lifelong interest in the humanities was prompted by his studies at Yale, where he received a BA in 1953. He later earned an MBA at Harvard. Franke was a fellow of the Yale Corporation for 12 years, serving as its senior fellow for six years. He received the Yale Club of Chicago’s William McCormick Blair Distinguished Service Award in 1996 and a Doctor of Humane Letters from Yale in 2001. His other honors include the Trustee Distinguished Service Award from the National Association of Governing Boards in 1998, election as a Fellow of the American Academy of Arts & Sciences in 1996, the Phyllis Franklin Award for Public Advocacy of the Humanities from the Modern Language Association in 2007, election to the American Philosophical Society in 2011, and the Yale Medal in 2012. Barbara E. Franke is a Sustaining Fellow and Trustee at the Art Institute of Chicago, where she co-chaired the public phase of the campaign for the new Modern Wing. She is a member of the Court Theatre Board of Trustees and the Visiting Committee of the Wineberg College of Arts and Sciences at Northwestern University, as well as serving on the Women’s Board and the Visiting Committee to the Division of Humanities at the University of Chicago. She received her BA in English literature from Northwestern University in 1954.